Starting a seed is the same no matter where that see will be planted. For urban growers, there can be several considerations to take into account during the development of a production area. 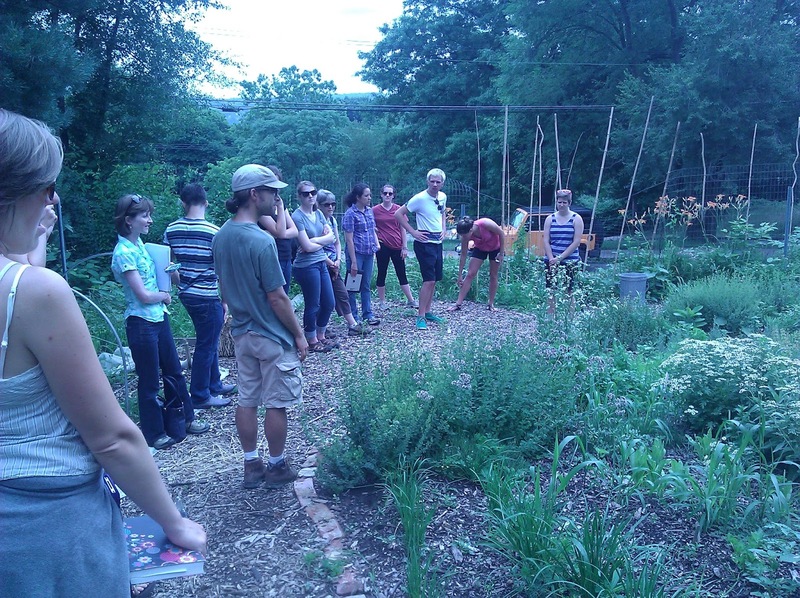 In early July 2013, over twenty faculty, staff, and members of Northeast Sustainable Agriculture Research and Education (NE SARE) traveled to Pittsburgh, PA to learn about some challenges urban growers face. Land acquisition, zoning constraints, soil contaminants and social justice issues are often incorporated into the business and growing plan, along with traditional concerns such as pests, diseases and too much or too little rain. Additionally, urban agriculture is one place where new farmers first learn the business of farming, as well as how to grow and manage crops, soil fertility, pests, and pathogens. There are over a dozen urban farms in Pittsburgh. The growers use agriculture and social concerns to re-purpose vacant land, in some cases with condemned buildings, into economically viable small scale farms with a split distribution model. This model typically involves selling specialty crops to high end restaurants at above market prices, with a portion of the harvest used to supply fresh food to neighborhoods classified as a food desert, that is, a neighborhood without a grocery store of farmers' market, and a high percentage of the population living at or below the poverty line. hope garden, cob oven, and an almost complete bioshelter. 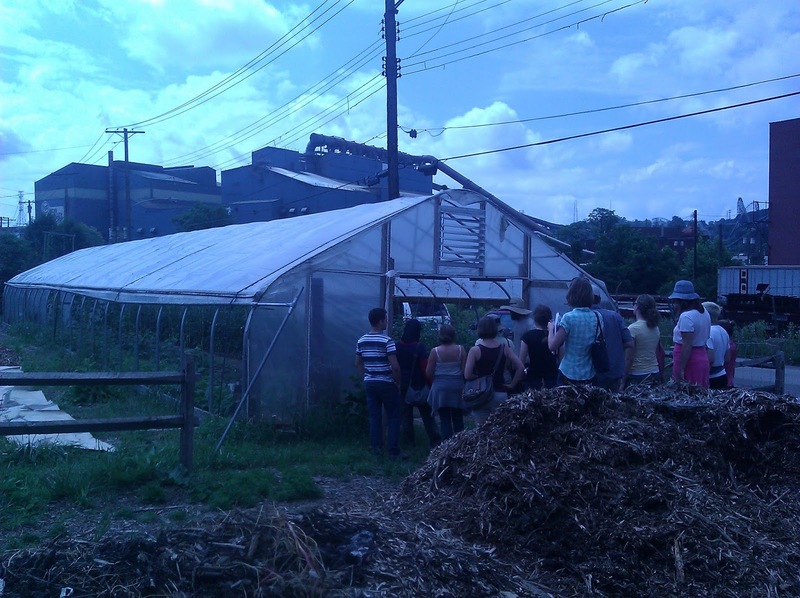 Four of these farms were highlighted for the tour: Garden Dreams Urban Farm and Garfield Community Farm, as well as Grow Pittsburgh who as urban farms at multiple locations, including the Shiloh Peace Garden and Braddock Farms. These farms have shown that urban farms, done correctly, can have long-lasting positive impacts on low-access communities. First, what is the soil quality? These environmental factors come with the territory of living in an urban area, especially one with such a long history of industry. How good is the soil itself? Most spaces used for farms were once the site of old buildings or factories, which can mean contamination and low fertility. The quality of the air also plays a role. In extreme cases of poor air quality, traces of dangerous residue can appear on the surface of produce. Second, what zoning and political considerations must be taken into account? Is the land publicly or privately owned? Is there a tax lien? For urban farmers, operating on vacant land or abandoned land may make the most sense. Securing the title to the land is important to ensure a farm's longevity. Occasionally, urban farms acting as a land steward instead of land owner have been lost to developers who are drawn to a neighborhood improved by agricultural activities. Create flexible space. Urban agriculture is limited by the space that is available. Because most plots of land are small, it is important to utilize the space effectively. Keep in mind how the farm will need to operate depending on the weather, time of year, and stage of production (seedlings to harvest). Create partnerships with other local businesses or groups. Large-scale farms have the capacity to be self-sufficient, but this is not always the case for small-scale urban agricultural businesses. There are many organizations that complement each other in both goals and services. In all cases, reciprocity is the key to successful partnerships. Identify the key issue. Poor food access is usually accompanied by a secondary problem. Many families struggling with food access may not know what to do with the fresh produce once it becomes available. Consider addressing this problem by providing cooking lessons or recipe cards when selling produce. Keep in mind the sustainability of your project. If your operation is funded mainly through foundations and grants, what happens if these funds become unavailable? Because of this, many urban farms have two customer bases: local restaurant and neighborhood residents. Finding a good balance between selling to local businesses for profit and serving the nearby residents is critical.